Trinity Designs: Welcome to the Family! Well, it wasn't such an early morning for me today, I got to sleep in till 7:15! I know, for those of you who actually leave your house to go to work, that probably sounds like heaven, I'm not trying to rub it in or anything. Believe me, during the school year, I feel your pain, but during the Summer - I sleep in every chance I get! My "office" is right down the stairs and I take full advantage of it! 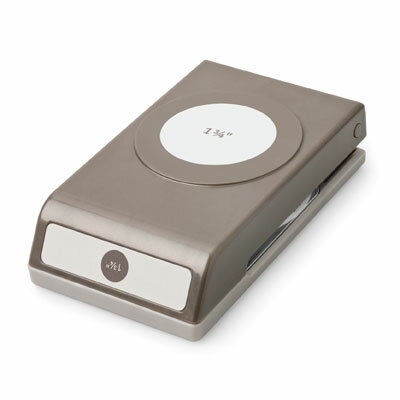 Working from home is just one of the many 'perks' of being a Stampin' Up! demonstrator - especially a full time one - and I love that part of my career choice. 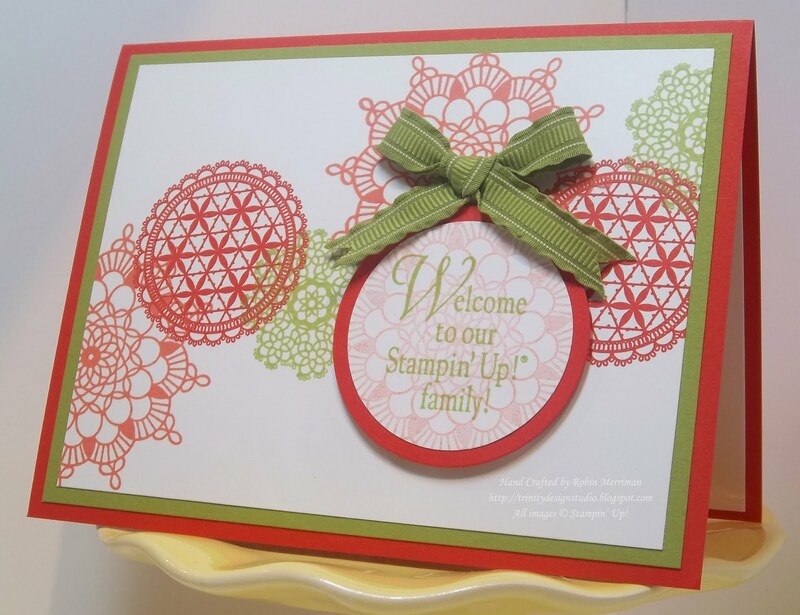 Speaking of being a demonstrator, last month, we welcomed several new stampers onto our team and I always like to send a Welcome card to them. I sat down last night to design one for these special ladies. Wanna see? I tried a bright, new color combination on this one and I really like it! Poppy Parade, Calypso Coral and Lucky Limeade! It's bright, fun and warm all at once - which always says "Welcome" to me. Two of those colors are part of the NEW 2011 - 2013 In Color Collection, Calypso Coral and Lucky Limeade. I'm still taking registrations for my NEW In Color Clubs through the 5th, so if you want to join in, check all the information at this post here: NEW In Color Clubs! 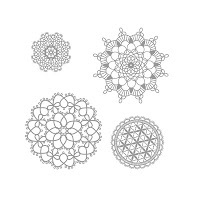 Using the Delicate Doilies stamp set, I random stamped a trail of doilies across the Whisper White cardstock front from left to right. This piece was layered on Lucky Limeade cardstock which was layered on a Poppy Parade card base. For the focal point, I cut a piece of Poppy Parade cardstock with my Big Shot and the Circles #2 Die. That was the layer for the greeting. I stamped the large doily in Calypso Coral on more Whisper White, but I stamped off twice on Grid Paper to lighten the intensity of the color. The greeting itself came from a stamp set we earned at Convention by attending our classes! That's a pretty cool way to reward someone, don't ya think?! I love that all the stamps in it are business related and give me a professional look. Yay SU! for that! I stamped my greeting with Lucky Limeade to stand out against the background and coordinate with the other Lucky Limeade color on the card. It was punched out with the 1 3/4" Circle Punch. 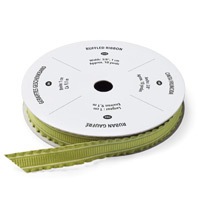 The greeting was finished off with a sweet little bow tied with the new Lucky Limeade Ruffled Ribbon. I attached it with Mini Glue Dots. Ya know, this color combination could almost be a Christmas card combo - just substitute my greeting with a holiday one! What do you think about that idea? I've got my first Christmas Cards class coming up on August 27th - do you think I should design a card with these colors/stamps? Here's a few of the products I used to create today's card. You can shop for them anytime in my Online Store. Have a great day everyone! 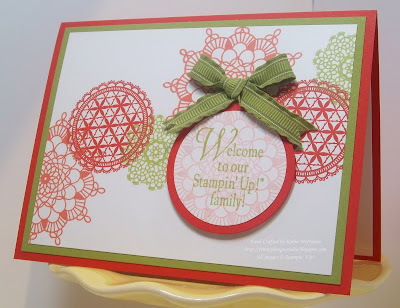 Be sure to come back tomorrow to see what I've created for Thursday's Simply Stampin' Up! weekly feature!